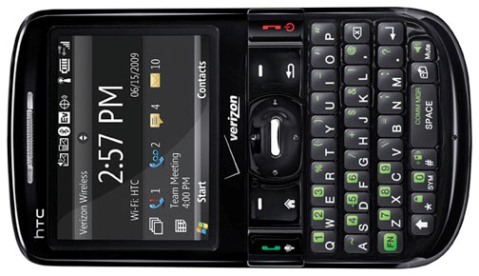 Verizon Wireless has expanded its smartphone lineup with the Verizon Wireless HTC Ozone (known as HTC Snap), which incorporates 2.4″ QVGA LCD screen, 2MP autofocus camera, Bluetooth 2.0 with A2DP and full QWERTY keyboard. Based on Windows Mobile 6.1 Standard OS, HTC Ozone provides users a host of connectivity options including the nation’s largest wireless 3G network, global roaming as well as Wi-Fi. The new stylish and elegant HTC Ozone that bundled with international charging adapters will be available through Verizon Wireless’ official site starting June 29 for around $50, after a $70 mail-in rebate and a new 2-year service contract.